A mid-Atlantic state, Maryland’s history is very long with many types of cultural groups contributing to the state over the centuries. Starting with the Native American Indians, the region offered forests with game and water for fish and oysters. Their native villages and settlements started appearing and their social structures increased in complexity over the centuries. Numerous tribal groups, such as the Yaocomicoes, Nanjemoys, Piscatways, Shawnee, Annemessex, Nanticokes and Choptanks flourished in the area. After the Europeans arrived with their infectious diseases was when the population of Indians decline severely. By 1740s the last major remaining tribe, the Shawnees, moved out of western Maryland lands for locations in the mid-west. In 1608, the English John Smith came into Maryland’s Chesapeake Bay. The Province of Maryland was established by the English in 1632 and the first 150 Irish and English settlers arrived on Maryland lands. It remained a province until Maryland broke with England during the American Revolutionary War of 1776. In its early colonial period, colonial period, the southern and eastern portions of the Province continued in their tobacco economy, but as the revolution approached, northern and central Maryland increasingly became centers of wheat production. In the early to mid- 1700s there was a push westward in Maryland, especially to develop farmlands. The earliest settlers in the 1600s to the Maryland colony was predominantly Roman Catholics. It eventually increased as a destination for English Catholics and had the highest percentage of Catholics among the English colonies. Maryland was also where the English government sent tens of thousands of British convicts. In the early years many settlers came over as indentured servants, working for another person who paid their passenger across the Atlantic. There were also African slaves brought to Maryland to work as laborers in the tobacco fields. Some Africans were allowed to earn their freedom just like the white indentured servants. In studying Maryland genealogy, the colony became also a major resettlement for the Protestant Mennonites of Germany in the 1730s. They were referred to as ‘Pennsylvania Dutch.’ They emigrated from Germany and Switzerland. The term ’dutch’ was really ’Deutsch’ meaning German. Those who had first settled in the southern end of Pennsylvania later moved into the central and western lands of Maryland and were farmers. During the American Revolutionary War, Maryland was very active with many of its citizens active soldiers. It also had a high number of those with German heritage, rough 20,000. On February 2, 1781, Maryland became the 13th state of the new nation. In 1790 the population of the state was about 319,700 citizens. By 1820 the population had increased to 407,300. There were 687,000 people in Maryland by 1860. With the Port of Baltimore figured into Maryland genealogy, the region has been a major entrance for immigrates to America, with many settling in Maryland. By 1860, Maryland’s free African-American population comprised 49 percent of the total of African-Americans in the state. Maryland was a border state during the Civil War with approximately 77 percent of the Maryland soldiers joining the Union side and the rest for the Confederacy. 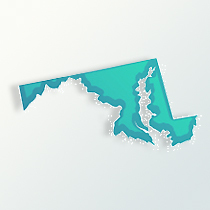 The ethnic background of most of Maryland is that of German, representing about 16 percent of today’s population. The Irish and English together are 20 percent. There is a strong Italian population in the eastern side of Maryland, which represents 5 percent of the state. In recent years, more Asians have settled in Maryland. Those with Korean, Filipino and Taiwanese ancestries make up 5.3 percent of the population. African-Americans are 29 percent and Hispanics as a growing population represents 5 percent in Maryland. The state has a total population in 2009 of about 5.7 million people. Occupations for Marylanders involved commercial fishing, centered in Chesapeake Bay, service industries (governmental oriented), agriculture and manufacturing include electronics, computer equipment and chemicals.